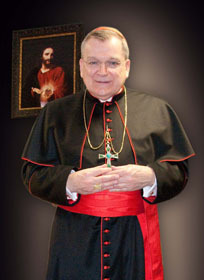 – Raymond Leo Cardinal Burke, D.D., J.C.D. Did I love God above all things today? Did I seek to love Him in all that I did? Did I put myself at His service? Was I aware of His presence? Did I turn to Him? Did I tell Him that I love Him? Was He the center of my life today? Did I neglect or omit my spiritual practices today? Did worldly anxieties, or fears, keep me from following God’s will? Did I lack trust in God’s love for me today? Was I critical of the Church’s pastors, in thought or word? Did I complain and murmur when I experienced difficulties today, instead of patiently accepting every event and “happening” as coming from God? Was I open to God’s inspiration today? Did I fail in “being Christ” to my family members or my neighbor? Did I love others for God’s sake? Did I practice self-forgetfulness, or did I practice self-pity and self-absorption? Was I obstinate, hardhearted, hateful, jealous, injurious, backbiting, violent or unjust in words or actions? Was I lacking in charity, forgiveness, or honesty? Did I gossip and cause injury to another’s reputation or goods? Was I impure or unchaste in any thought, word, or action? Did I steal from, or cheat, someone? Did I behave in a manner that reflects badly upon or could give scandal to the Church? Was I excessive in my zeal, or uncharitable in my witness of the Faith? Was I disobedient to the directives of those in authority over me? Have I been cooperative and generous with my time, energy, and talents in the work of the Church, especially in the apostolate of catechesis? Did I fail to make an honest effort to grow in one of the moral virtues of prudence, justice, fortitude and temperance or the theological virtues of faith, hope and charity? Did I fall into discouragement? Did I fail to go forward in serenity and trust in God? Did I fail to practice some form of mortification?